The United States will know who its president is for the next four years by Tuesday night – assuming nothing goes wildly wrong, of course. (We’re looking at you, year 2000.) In the mean time, tens of millions of Americans will flood to polling locations around the country to cast their vote – a feat made abnormally difficult for those in the Northeast thanks to Hurricane Sandy upheaval. Lucky for everyone, the Pew Center on the States has created the Voter Information Project (VIP), and partnered with some of the biggest technology companies in the U.S., to keep voters in-the-know on Election Day. “The way VIP works is, states directly participate in the feeds. They provide official election information, including what’s on the ballot, the polling place information,” David Becker, Director of Election Initiatives at the Pew Center on the States, told Digital Trends. “And we’ve even collected information that we call ‘rules of the road,’ which are relevant election rules that everyone should know.” These rules include things like whether you need an ID to vote in your state. All of this data collected by the VIP from state election offices is the fed through an API, which tech companies, including Google, Microsoft and AT&T, have used to create Web and mobile tools for voters. Here are the VIP tools – plus a couple bonus resources – you should know about on Tuesday. Google’s Voter Information Tool, which can be embedded into any website, incorporates Google Maps and VIP election data to create perhaps the most useful mashup on the Web. With a quick search of your address, you’ll find out all the presidential and congressional candidates on your local ballot, their party affiliation, and a link to your state’s online election hub, which provides additional details. Facebook has also joined in on the VIP party, with its own polling place locator, which is built into the social networks U.S. Politics page. 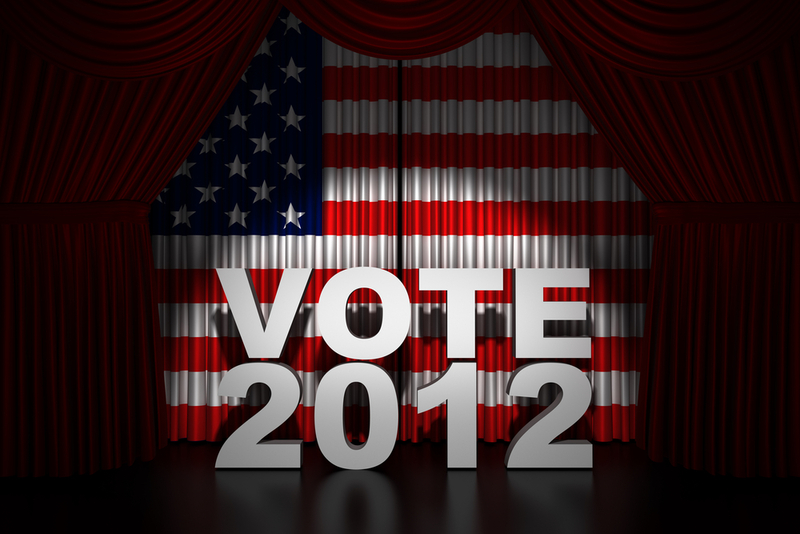 Users can also tell their friends about their Election Day plans with the “I’m Voting” pledge. At the time of this writing, roughly 344,000 people told their Facebook friends that they plan to vote. Built by AT&T and Politics360, VoterHub is a free app for iPhone, Android, or Windows Phone devices that provides everything from polling place locations to Associated Press real-time coverage of Election Day. It also allows users to share information easily through the gamut of social networks, including Facebook, Twitter, Google+, LinkedIn, Foursquare, as well as email. If you don’t feel like downloading an app that – let’s face it – you’re going to delete by Wednesday, you can simply visit VoterHub.us to access all the Election Day goodies. Late last week, Foursquare unveiled a new free app called I Voted, which also provides polling place locations, and details about what you’ll find on your local ballot. 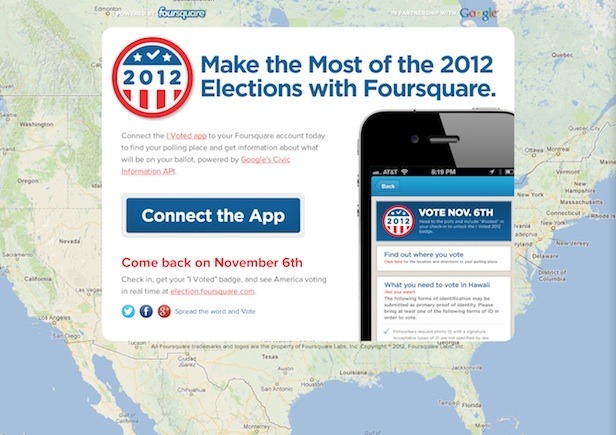 Once you’ve voted, you’ll receive a “I Voted” badge, and be placed on Foursquare’s real-time map of I Voted users. Finally, we have the Video the Vote project, which urges citizens to document any suspicious activity at their polling places using their smartphones. Video the Vote provides concerned voters with all the information they need to properly record things like vote intimidation, and how to share their videos with the public. To join the Video the Vote project, click here.